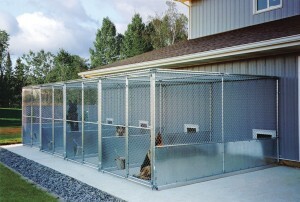 Good ventilation is essential to keeping boarding kennels safe, healthy, and efficient. When a ventilation system is not working to its full potential, poor air quality is detrimental to both the animals and kennel operators. When it is working properly, a ventilation system reduces unpleasant odors while reducing the concentration of infectious airborne diseases. There are many critical do’s and don’ts when installing and using kennel ventilation systems, so here are a few tips to help you achieve and maintain an odor-free, clean air environment. Insulate the building well and weatherstrip the doors and windows. This will lower the heating and cooling energy costs. Caulk or secure tightly all openings to the exterior to prevent drafts on the occupants. Install an automatic operating ventilation system with Controlled Air Circulation (C.A.C.) to achieve the best air quality for the occupants. Install unit heaters of the non-vented variety rated for use indoors. Use a residential furnace without a stainless steel or ceramic lined heat exchanger for kennel heating. Ammonia and water will corrode any ferrous metal it contacts. Allow leaks or opens to the airstream or the products of combustion (CO, CO2, and H20) can infiltrate into the kennel. An existing residential furnace should be tested by a qualified heating contractor by taking a smoke test of the heat exchanger to check for leaks. Install exhaust fans of metal or any other corrosive material. Stainless steel, fiberglass or other materials that are non-corrosive will outlast other materials and are easy to clean and disinfect. The desired outcome of properly designed and installed ventilation systems is to create a comfortable and safe environment for animals and the people who care for them. If you would like to learn more about the basic components of a ventilation system, fill out our simple contact us form and ask one of the experts at Osborne Pet Supply how you improve the environment of your animal facility.